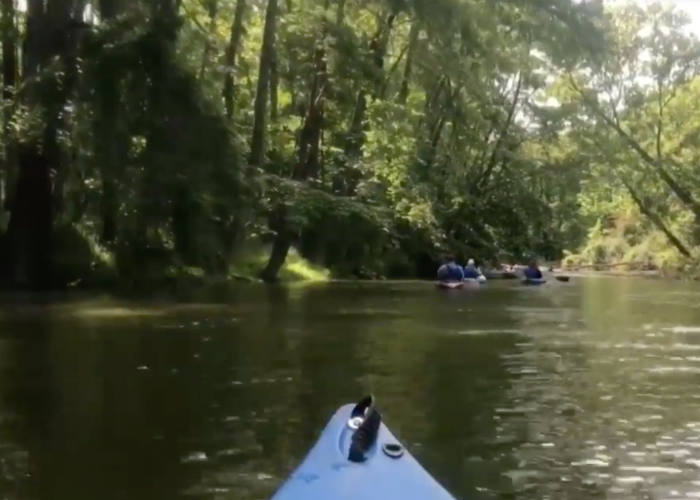 The Flint River is famous, notorious perhaps, but it is also hugely mischaracterized and all too often just overlooked completely as a destination for fishing, kayaking, and wildlife. Check out the video above to get an up-close look at the River as experienced recently Flintside reporter Jake Carah. Read below for six facts that might surprise you. The Flint River is a big system that impacts many communities. The Flint river system is 1,400 square miles, and flows through the cities of Montrose, Flushing, Genesee, Columbiaville, Lapeer—and, of course, Flint. The Flint River also feeds into other waterways like the Kearsley Creek, Thread Lake, the Swartz Creek and Misteguay Creek near the northern border of Genesee County and Shiawassee County. The Flint River’s name comes from the Ojibwe language, BIIwaanagoonh-zibi meaning, “flinty river.” The area is believed to have been highly contested by local tribes. Remains found at a Stone Street construction site in 2008 are thought to be those of the Sauk Indian tribe, which vetted for control of the area along with the Chippewa and Ottawa tribes. The Flint River is home to turtles, smallmouth bass, walleye and trout, as well as caddisfly, and water penny. All recent testing show no indication of lead, as well as the river chlorides testing at 49-86 milligram/ Liter. This is well below the Federal Drinking Water Standard for chlorides at 250 mg/L. The Flint River is home to a burgeoning bald eagle population. Two groups returned in 2015 to the area, which is ideal because of their fish-based diet and extreme aversion to human presence.